One fact that everyone who has ever met a cat knows to be true is that cats love boxes. Thanks to our recent move, our home is full of boxes. 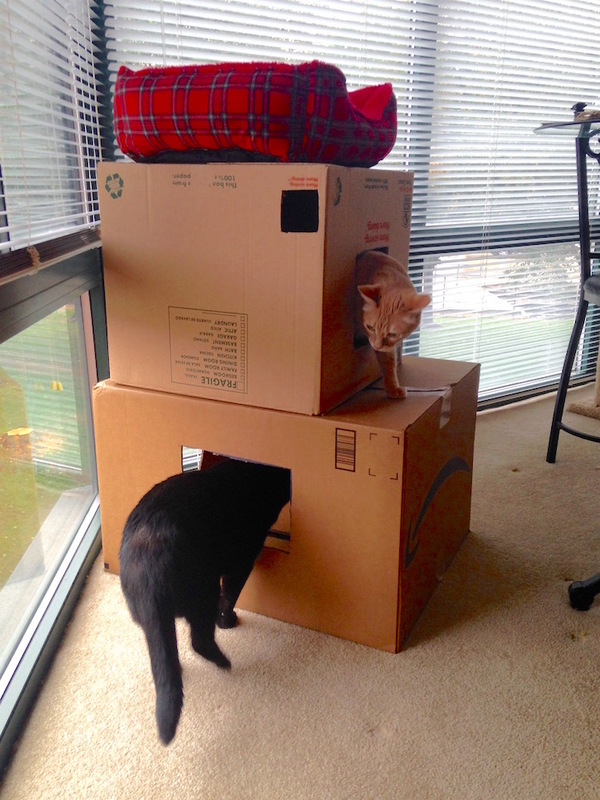 I decided to take a typical box to the next level by creating a box castle for my cats. You can do the same by following these simple steps. 1. Make a plan for the layout of your castle. My design was simple. I had a large box and a smaller box, so I decided to simply stack the smaller box onto the larger one. Plan ahead for how you will stack your boxes before you start adding windows and doors. Avoid stacking more than 2 large moving boxes on top of one another — that would make your castle more likely to topple over. 2. Prepare the boxes for placement. Once you have a solid plan for the placement of your boxes, make sure all sides of each box are secure. The boxes will be more sturdy once they are stacked if you have both the tops and bottoms closed and sealed. You will create the entrances into the boxes in the next step, so for now, seal the boxes completely. Boxes. Cats can’t get enough of them. Trace square or circulator shapes into the boxes that will be large enough for your cat to enter and exit through, but not excessively large. There should be at least 1 of these openings on each box. I added an extra opening on the bottom box as well as a tiny window on my top box. One you are satisfied with the shapes you traced, cut out the shapes using scissors or a knife. Stack the boxes according to the plan you made in Step 1. You can place blankets on the floors of each level of the box tower if you want. I added a cat bed that fit perfectly on top of my top box. You can decorate the boxes by coloring them or wrapping them with wrapping paper, but I opted for the authentic box look that my cats seem to love. 5. 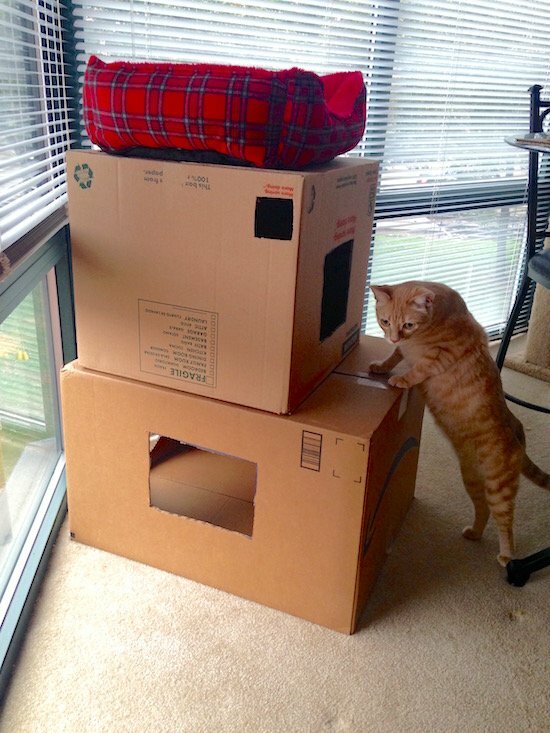 Introduce your cats to their new castle. Supervise your cats while they are using the castle the first time to make sure the entrances are large enough for them to use. My cats love their new box castle! Note that this project won’t last forever, of course. Remember to recycle.